Much has been said and spoken about Manchester United and their faltering form. The transition from Sir Alex Ferguson to David Moyes was bound to include some bumps along the way, but the former Everton manager is bound to be found scratching his head while reviewing some recent results and displays. Moyes was considered to be a reactive, reliable, safety-first manager, but his credentials have left much to be desired so far. And while reading through most of the English football press might lead one to believe that it is all a matter of simply adding a few players to the squad, it is hardly the case. Case in point, the first goal Swansea scored at Old Trafford last weekend for the FA Cup. Manchester United are picked apart smack down the centre by 4 simple touches from Swansea, starting from their centre-back. Since the match is pretty much in slow motion, it is difficult to accept such bad defensive positioning from the current English champions. Swansea's centre-back Chico Flores has the ball and already United look out of position. Javier Hernández is contributing nothing defensively and Danny Welbeck is trotting backwards. Oddly enough, it's Tom Cleverley - one half of the midfield duo who comes out pressing the man on the ball. Darren Flatcher is not providing any sort of coverage for his defence either. A simple vertical pass down the middle bisects the entire United team and overcomes six players in one sitting. Swansea perform one of the most run-of-the-mill movements in football, with the striker Wilfried Bony dropping back to support the build-up play and left-winger Routledge exploiting the space vacated by the Ivorian forward. Bony passes it back to Pozuelo who immediately tees up Routledge. Rio Ferdinand's lack of pace is only made worse by his odd decision to half-press Bony when he has little protection from up front (yellow circle) and there doesn't seem to be any support from his team-mates in defence. 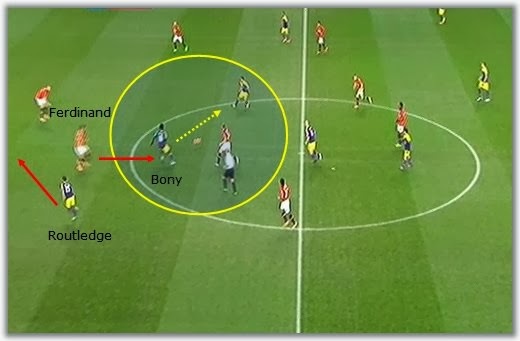 Jonny Evans does not come unscathed from this defensive debacle, as he takes ages to adjust his positioning according to Ferdinand's decision and Routledge's movement. It is indeed Chris Smalling (deployed here as right-back) who tries to make up for his team-mate's rash decision. In acres of space, Routledge found it easy to lob Lindegaard and score the first. Looking at the play from a different perspective, the situation looks even more baffling. United's back four are clearly left exposed (again, this is not in any a counter-attack or a quick-paced transition). 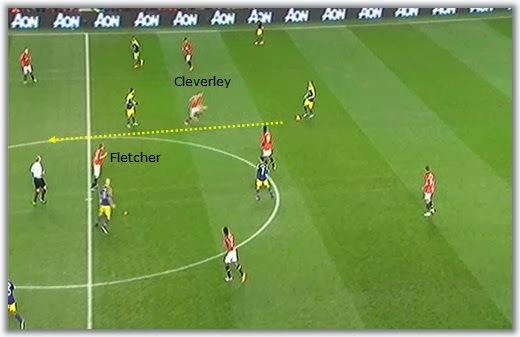 Cleverley is almost in line with his forwards and Fletcher cannot track anything that is going on behind him (yellow circle). The almost ubiquitous 4x2x3x1 formation often seems to lead coaches and players to believe that forming two banks of four is enough, often forgetting that movement and coverage are key in order to avoid opponents from pouncing on such vulnerabilities. The zonal occupation of spaces is apparently on the wane in England, as it becomes ever more frequent watch the full-backs in the Premier League worrying about their direct opponent, rather than concerned with providing coverage for their defensive team-mates. In this particular case, both Smalling and Büttner offer barely any contribution for United's width control - thus making the team wider and more open to this sort of penetrations. 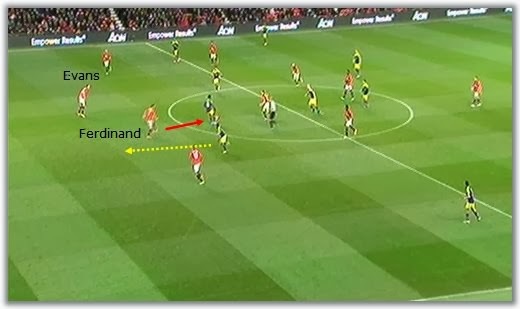 Here, Ferdinand's delay is even clearer, as well, as Smalling and Büttner's removal from where the action is taking place. 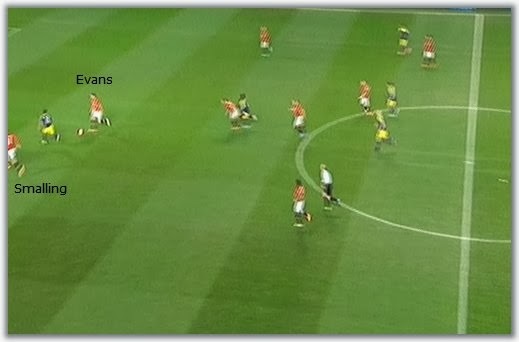 Watching Ferdinand pass by him, Evans does not adjust his feet accordingly and remains facing forward. Evans has just finally realised something is not right and starts turning (rather slowly). 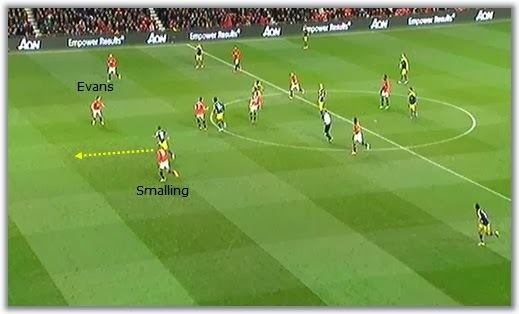 He was easily outsprinted by the quick Routledge and only Smalling is in a position to bother the left-winger. "Hindsight is a wonderful thing," some may say. While that is certainly true, the lack of defensive organisation in most Premier League sides should offer some food for thought. The return of the once thought to be outdated 4x4x2 (in some shape or form) has brought about more goals and scoring opportunities, but does not bode well for coaches (in a purely coaching sense) nor for clubs - European competition will certainly be less forgiving about this sort of mistakes.